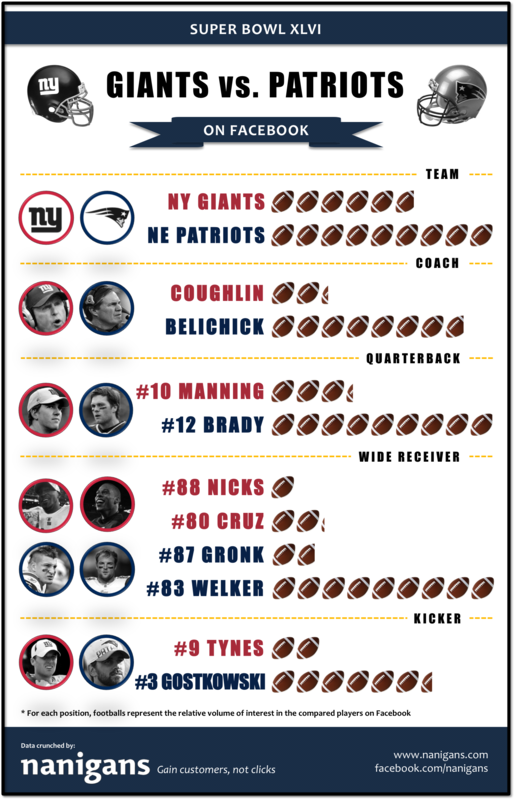 The wide receiver position is the only position where a Giants player has more Facebook buzz than a Patriots players. Giants wide receiver Victor Cruz has slightly greater Facebook reach than Patriots wide receiver Rob Gronkowski. That being said, there is considerably more interest in Patriots wide receiver Wes Welker to make up for the difference in that position. For fun, we were also curious about the gender composition of fans of quarterbacks Eli Manning and Tom Brady. Would you guess that Brady has a greater portion of lady fans than Manning? We did; but, to our surprise, Manning actually does. 47% of people mentioning or Liking Manning on Facebook are female, and that number is only 37% for Brady.